You’ve done it! You’ve written new copy for each page of your website. Everything is uploaded, images are in place and you feel as if you’re finally ready to launch. But, as you hover over the “publish” button, you hesitate. Did you miss something? Chances are if you haven’t taken the time to double check your website copy, you probably did. Ready to Hit Publish? Check Your Website Copy First. We’ve said before that a first impression is the one that matters. And although mistakes are only proof of your humanity, too many mistakes and tedious copy can cause your audience to lose faith in you. 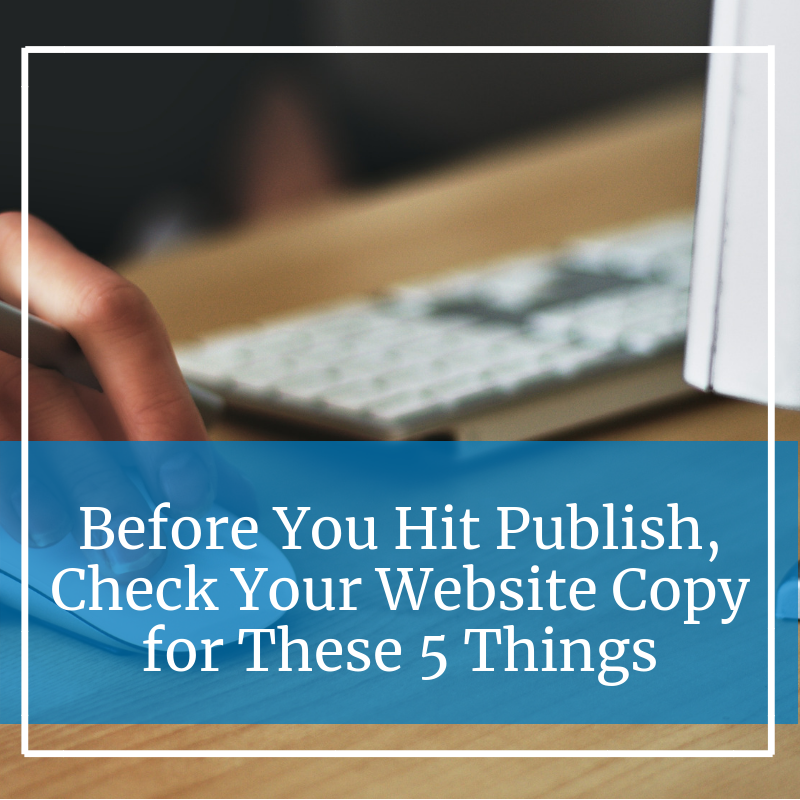 So, before you hit publish on your new website, here are five things you should check your new copy for. Read over your website copy and check for inconsistencies across your website. For example, make sure your point of view (first, second or third person) is the same on each page. You’ll also want to make sure your voice and tone are consistent with your brand. These seemingly small inconsistencies can confuse your reader, leaving them questioning your message. Even the best writers fall victim to the typo. And although most readers will overlook a typo or two, more could leave them questioning your attention to detail. Read through your website and use tools such as Grammarly to check for typos in your copy. The format you use for your copy should make it easy for your readers to skim for information. Check your copy for big blocks of content that you can break up into smaller pieces. If you need to, reformat or reorganize to make it easier to digest. Does your content flow well on the page? The best way to check for this is to do a read your copy out loud. If there are places that just don’t seem right and you can’t pinpoint why…it could be the flow. Try changing things up or reorganizing to improve content flow on the page. When you own a service-based business, it’s easy to get lost in the process. But, remember that your content is written for those who are looking for a guide. They don’t have the knowledge or tools necessary to do whatever it is on their own. Check your copy for places that get too deep—places that threaten the connection between you and the reader. Put simply: don’t miss the story by focusing on every single detail of the services you offer. Ah, fancy, industry-specific speak. Although it’s often seen as required to make you sound knowledgeable in your niche, it isn’t. In fact, jargon can often be impossible for your reader to understand and can turn them off from your copy in an instant. Check your copy for difficult jargon and try your best to simplify for the sake of your audience. In fact, this is far from the truth. Your website might be the only communication a reader has with your brand when determining whether to trust you with their need or issue. Why not showcase how amazing you are from the get-go? To learn more about preparing your website copy for launch, send us a message.